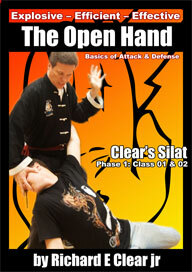 Clear’s Silat Open Hand Methods include swiping which is a block or parry for a beginner and a pressure point strike or a break for a more advanced student. Essentially it just looks like a slap and in many ways it is just a slap. If you turn your body a little towards the direction you are slapping it is not to difficult to learn how to put your body weight into it and then it becomes powerful. We also use the Open hand and actually part of the forearm to do an Open Hand Method we call a cut which is basically a slicing motion of the hand and arm. This is designed to make initial contact and brush the attackers incoming punching arm so that their attack can be redirected with very little force. 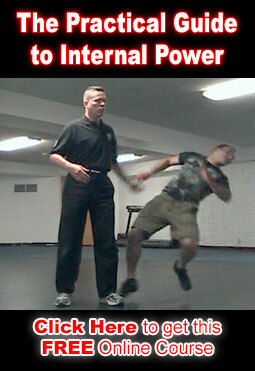 This technique tends to take a little more training and is much easier to show than to explain in writing. There is also slap and cut. I have heard this technique referred to the Jewel of Java because every Javanese style contains this particular Open Hand method / technique somewhere within their system. First, you slap across your body making contact with their incoming punch and then you raise your remaining hand to replace the contact you already have on their arm with your first hand. This is the defensive use. On the offense you would then take hand # 1 and it would be doing something offensively as soon as hand # 2 makes contact with the attackers arm. For simple applications it can be an arm break or a strike to the back of the head whichever is best or seems best at the time. Open Hand Methods can be swiping methods that join or that cut. Joining is usually done to a straight punch and cuts are usually used on haymaker type hooks. Slap and cut can be used on both straight punches and haymaker type hooks and will work well against most head and upper body shots.